Winter coppicing work. 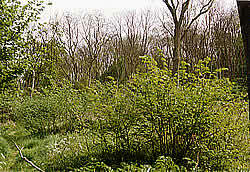 The majority of the wood comes from traditional coppicing and thinning work carried out during the winter in local broadleaved woodlands, several of which are ancient semi-natural sites and/or nature reserves owned by bodies such as the Woodland Trust, the Wildlife Trusts, or other private landowners. 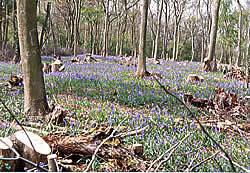 Bluebells in springtime after coppicing. The main aim of this sort of sensitive management work is to enhance the nature conservation interest of these woodlands, being highly beneficial to many plant and animal species which depend on these sites for their survival, whilst at the same time producing a wholly-sustainable and self-renewing source of wood for sale as fuel the following winter. 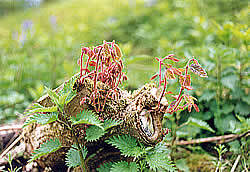 New Wych Elm coppice shoots. 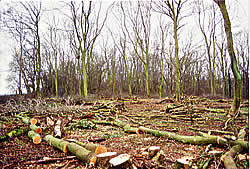 The whole-process is generally `carbon-neutral', causing no addition to the so-called Greenhouse Effect caused by the burning of fossil-fuels as no trees are actually destroyed and killed, the intention being that all trees felled will send out new shoots from their cut stumps and regrow as coppice, able to be harvested repeatedly in this way in cycles of 15 to 20 years. Wych Elm coppice regrowth after 3 years. The restoration of coppicing in these ancient woodlands helps to revitalise the old stools and perpetuate them into the future. Many of the logs produced in this way have therefore come from trees that were alive in medieval times or earlier, and will hopefully continue living on for centuries more.